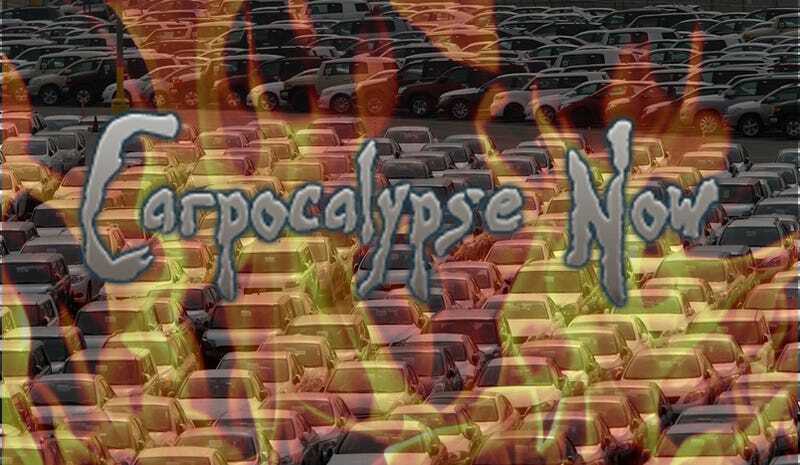 The Carpocalypse draws nigh after Senate Republicans lanced last night's bailout. In response, the White House now says "all options are on the table" and Toyota's scared after its stock drops 10%. The S&P said a month ago that if the credit crunch wasn't taken care of, by 2009 the world would be facing global automaker liquidation. That's what we call the Carpocalypse and it's getting much closer to reality after Senate Republicans killed the House bailout bill without brokering a compromise, hung up on an attempt to strong-arm the UAW into a wage reduction for current workers that apparently isn't factually based. Meanwhile, Toyota poised for its first U.S. sales decline in 13 years, canceled its 2009 annual dealer meeting in Las Vegas to trim expenses as consumer demand for new cars plummets. Additionally, the Japanese automaker released a statement saying a bankruptcy among the not-so-Big Three would "exacerbate an already difficult environment" for itself and the industry as a whole. On those comments, and thanks to the Senate Republicans, shares were off 10% in Nikkei trading today. In response, the White House just moments ago claimed "all options are on the table" including, apparently, looking to breaking off a chunk of the $700 billion in TARP financing set aside for the financial industry. Toyota stock recovered after this news, down now just over 1.5%. Fears of a bankruptcy of any of the not-so-Big Three also hit Honda today, who we just heard will now be cutting output in North America by 119,000 between now and the end of March at plants in Alliston, Ont., Ohio, Alabama and a new factory in Indiana that began producing cars just last month.. Run for the hills, folks!